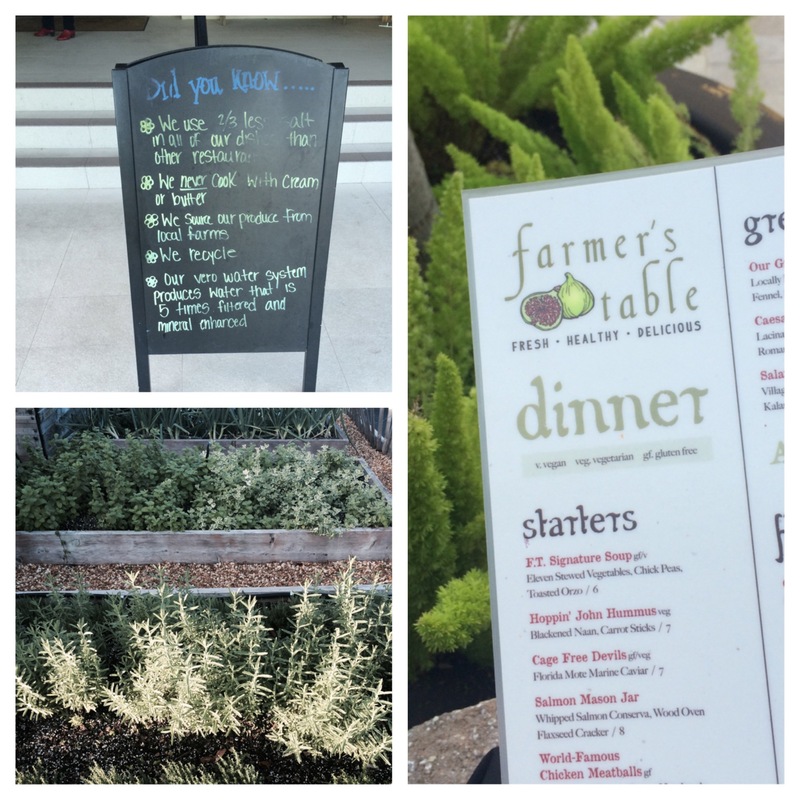 As a tiny, little miracle, I found some real food tonight AND an “actual sit-down-in-a-restaurant” experience at Farmer’s Table in Boca Raton, FL….yay! Asked the front desk about this cool sounding place but they had never been – only heard good things…OK , so let’s go. It was perfect – great food, nice service, stellar people watching – local fruits and veg, organic, vegan, vegetarian and gluten free options plus I got to sit outside….a real luxury in my opinion…A Florida Salad (avocado, greens, oranges, fig vinegarette) and House Soup (11 roasted veggies, chick peas and toasted orzo)…they grow tomatoes on the rooftop and herbs in the parking lot! This is a one and only, not-a-chain place….so happy to have found it. Check it out! And his ideas on the “Clean 15” – foods you don’t need to buy organic…. Interesting and helpful! Feeling great – and in retrospect, I should have not indulged in the Chocolate Mousse Cake – hey, vegan and made with almond milk – I had to try it. Lucky (blessed, privileged) me to have had this nice meal tonight…. One is the loneliest number – wait – ZERO is! Made a decision to drive out there in the zero last night – getting to the Leaf and Bean in Chili took about 3 times as long because of the rush hour traffic and the frozen, slushy, slippery mess on the roads. Well worth the trip to have time with friends – my “Reverse Mentors” Christina and David. We had plenty of time to catch up – nice! 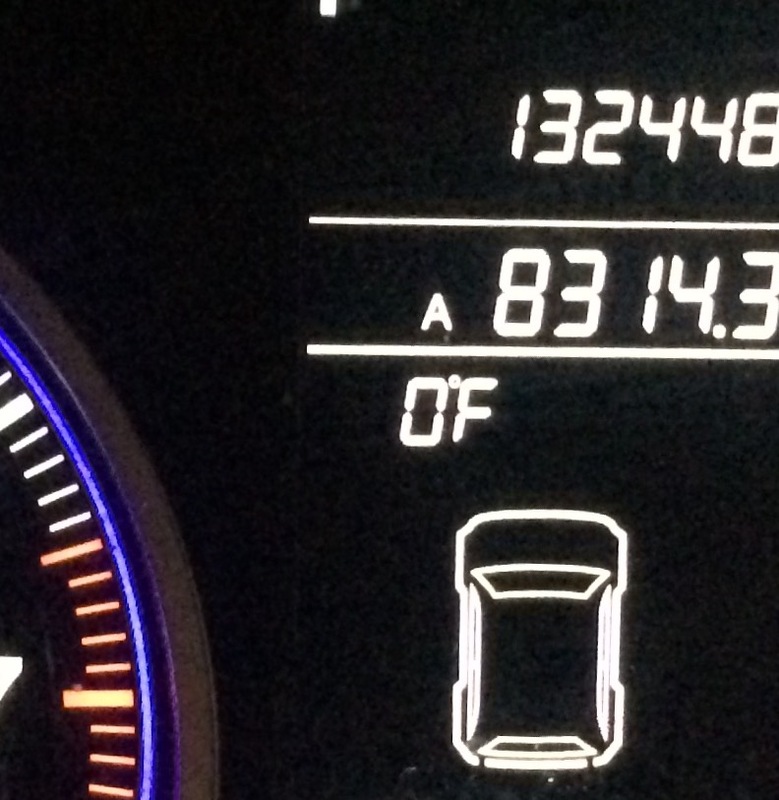 Closed the place down at 9:30pm – living on the edge we are! This local coffee place is a gem – great food, excellent coffee, kind staff, open yet cozy space. Original referral from Tom Priester! I had a hearty meal of Triple Grilled Cheese Sandwich and Tomato Basil Soup – Oh AND a Salted Carmelllllly Hazelnutty Mochachacha Lattechino. In spite of the decaf, this drink is the cause of my final 2:3oam bedtime. Darn it that sugar. Better weather today – sunny and school is ON – it has warmed up to 13 degrees….heading to Henry Hudson School in a bit! May you have local coffee today…or skip it! …but somewhat sunny which helps! And a space heater which HELPS ALOT (I am shouting) – 0rdered it on November 18 and received January 5 – it was back ordered. It is a refurbished Eden Pure heater on wheels MADE IN OHIO. Is it wrong to love an appliance? Appreciating the heat and being able to keep the thermostat at 63 and still feel OK in my home/office. We are on a “Code Blue” here in the ROC – any time it gets below 20 degrees there is extra effort in raising awareness for the needs of our homeless. Shelters are in more need these days because of the cold and in the after-holiday donation lull. This could be a great day for you to skip one cup of coffee and donate that amount to a shelter in your area. Every dollar helps. OR skip your coffee for a week and engage a group of co-workers or friends. This is not about feeling guilty for being able to buy a cup of coffee it is about the gratitude for said coffee (and other things you have or have access to). And about putting your wants aside for a short time to benefit someone else. Guilt is a useless emotion – feeling bad about something you did or did not do usually in the past and usually something you cannot change. Replace guilt with gratitude and you can shift your mind and heart to a future place of change. Do a quick web search for a shelter in your area and send a few dollars – at the ODM, $14.35 provides 7 meals. That is approximately 3 tall peppermint mochas. Do what you can when you can, close to home or far away, for friends and strangers, in your backyard or across an ocean. LET THERE BE CHERRY ALMOND OATMEAL COOKIES! 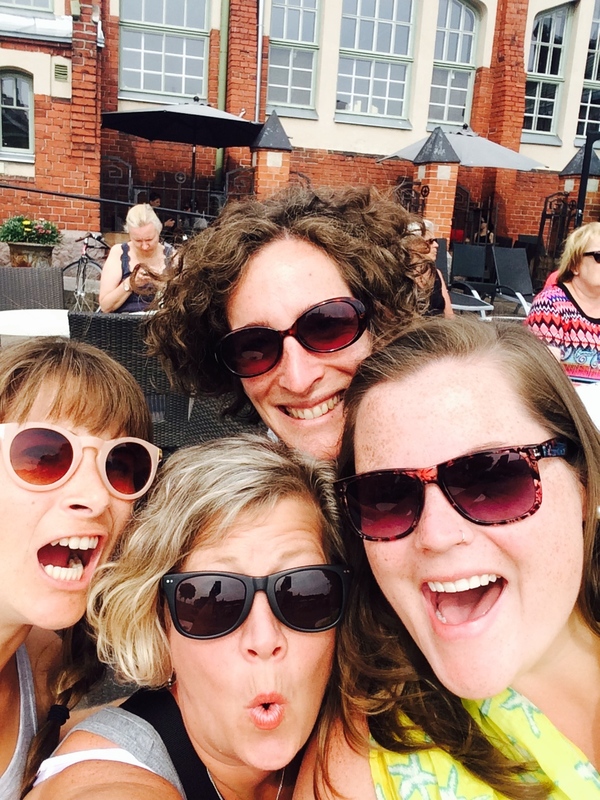 OK – this is the last in the LTB Series….moving on! In the name of health and safety, I sampled a few last night to be sure they met the quality control standards. It took 3 tries to be very sure. 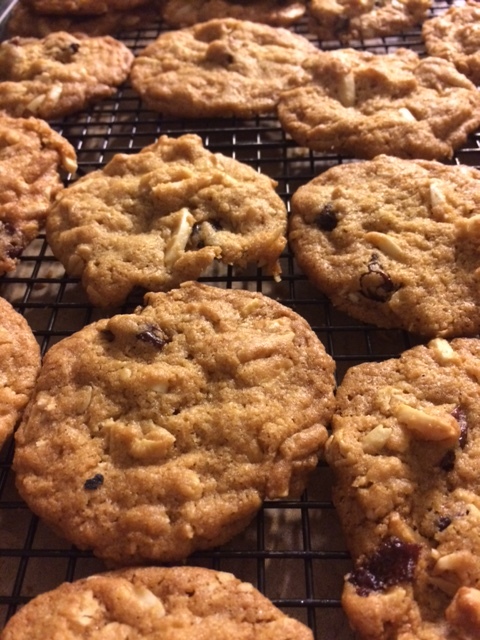 Used a basic cookie dough and instead of chocolate chips (not interested in stopping at a store/going outside) I used what had around – dried cherries, slivered almonds and oatmeal. Hooray! Deluxe items, I know…especially the cherries! Raisins and walnuts would work too. 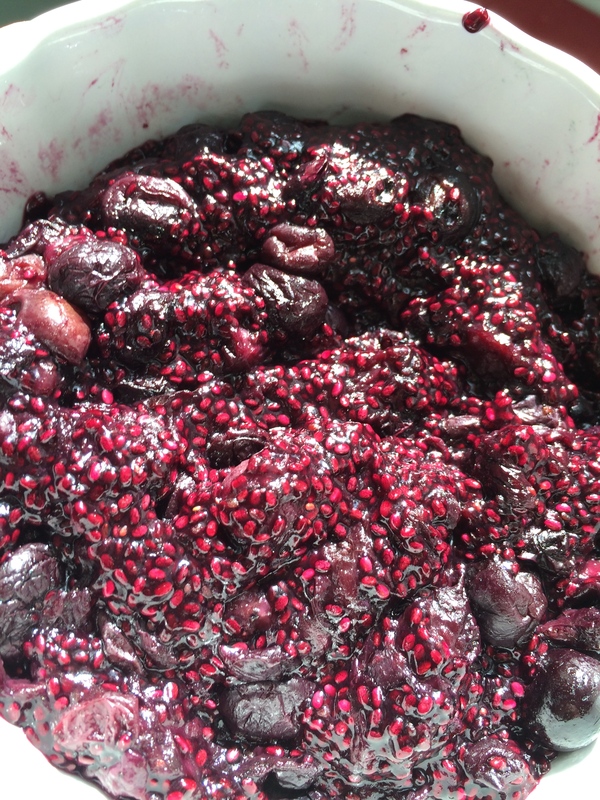 LET THERE BE BLUEBERRY CHIA JAM! Have no fear, soon I will end the “Let There Be” series. 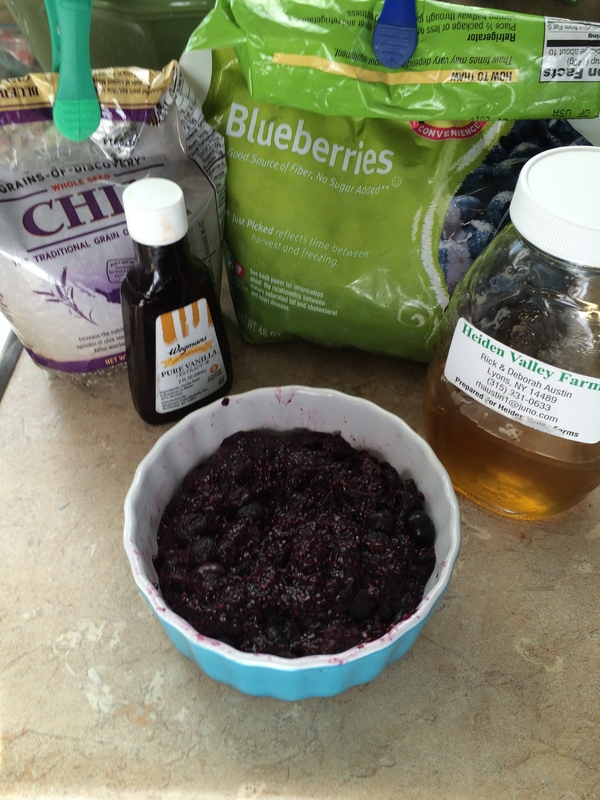 Meanwhile – here’s the wildly easy recipe – chia takes the place of pectin and adds flavor, fiber and a tiny bit of protein….I used honey instead of agave and the blubes were frozen. AND I cut the recipe in half as a test…Result? Tasty jam! Will make this again for sure. Oh and the word chia comes from the Mayan language meaning strength…yes please! That is all. Now I shall go FINNISH another pillow. See what I did there? You will find that I get funnier as the day progresses. I am grateful for so many wonderful Semester at Sea experiences and memories….AND….a favorite is spending time with friends at an International Flea Market in Helsinki…we shopped around for cool stuff, talked, ate hearty sandwiches, sat in the sun and walked around town…THE BEST. When I got home, I considered keeping them as actual drapes for about a day but I am sure they would have been too busy for my space – plus I really wanted to share my FIND! 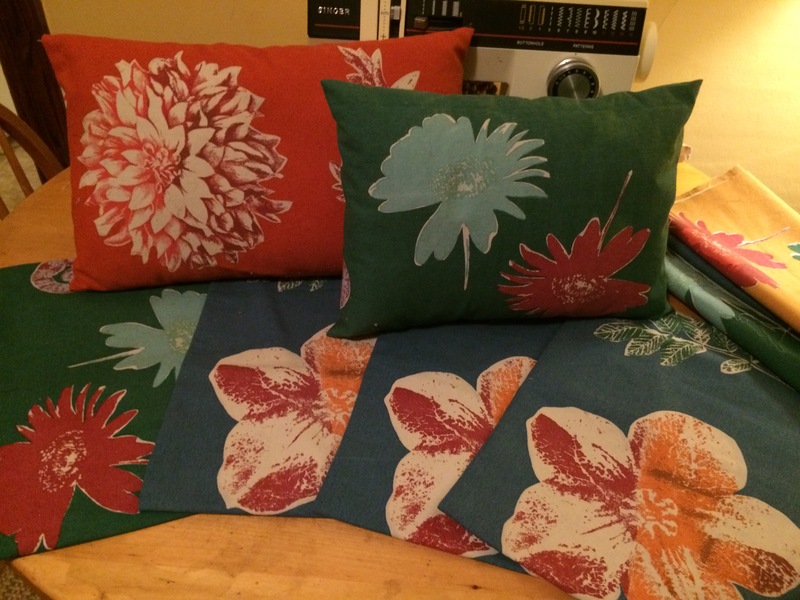 So I started cutting – it felt a little wrong to be altering such beautiful fabric. All I could think about was who made the curtains, what was the cottage like, where was it, were they a big family, what was her mom like, where is here mom now? One by one the panels turned into strips and strips turned into pillow covers. With a lot of help from My Mom Marcia, might I say. Felt like Mother-Daughter bonding time to me AND there may be a chance it may have felt more like work for her hahaha! I had a prototype I’d made in October but that was for a bigger pillow I already had…the new pillow forms I was using required some adjustments. Each pillow was different depending on the way things lined up and how the pattern was laid out. Following some stress and a laughing fit or two with how “interesting” the final products were turning out, I got better at measuring, cutting and sewing – channeling domestic energy from Mom and Grandma – nice to have Mom here in person! Mrs H-Something, my Jr High Home Ec teacher would be proud. Better turnout then that “sundress” I made in 7th grade that was more like a table-cloth with ties for straps. Don’t ask. Happy Hummus to you! I am working on the ultimate easy recipe to share (and taste) on Good Day Rochester on January 23….this is the one! I used fresh chick peas (garbanzo beans) I’d frozen a month ago so the hummus was a little less smooth than I am used to. Tasty nonetheless! Canned chick peas is an option but I do prefer fresh. I also used reconstituted lemon juice – of course fresh is better – but not local, so you could leave it out. I also left out the parsley which some recipes call for. You can make a batch to enjoy now and another to freeze…I like to freeze stuff in smaller containers so I can take out what I will use. Bring it our of the freezer and let it thaw in your fridge…It’s nice to warm it up a little too right before serving. 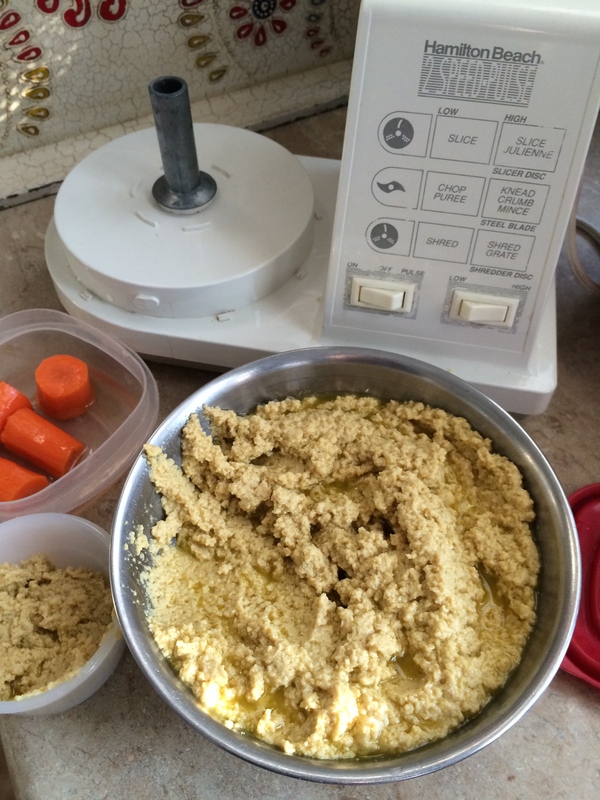 Hummus News – in case you were wondering and want to avoid well known mistakes….and by the way, may this be your only worry today…. I am committing to homemade hummus for the year – with the end goal to continue reducing the amount of plastic I buy/use. I must leave you now and go have a snack. YAY SOUP. Roasted Carrot Parsnip Soup. Thank you Real Simple magazine! After roasting the veggies, I added some fresh ginger and used vegetable stock in place of the water…delicious! The parsnips add a rooty, earthy flavor – like it. Adding to my soup repertoire and ongoing goal of being a Soup Master – happy to add RCP Soup the menu…along with Butternut, Black Bean, Pumpkin, and Carrot Ginger. There is something about making soup that makes me happy…starting with the privilege and blessing of having food in the frig…plus I think it’s the simple joy and of access to the ingredients, the tools and the time…and an edible end result – yum! 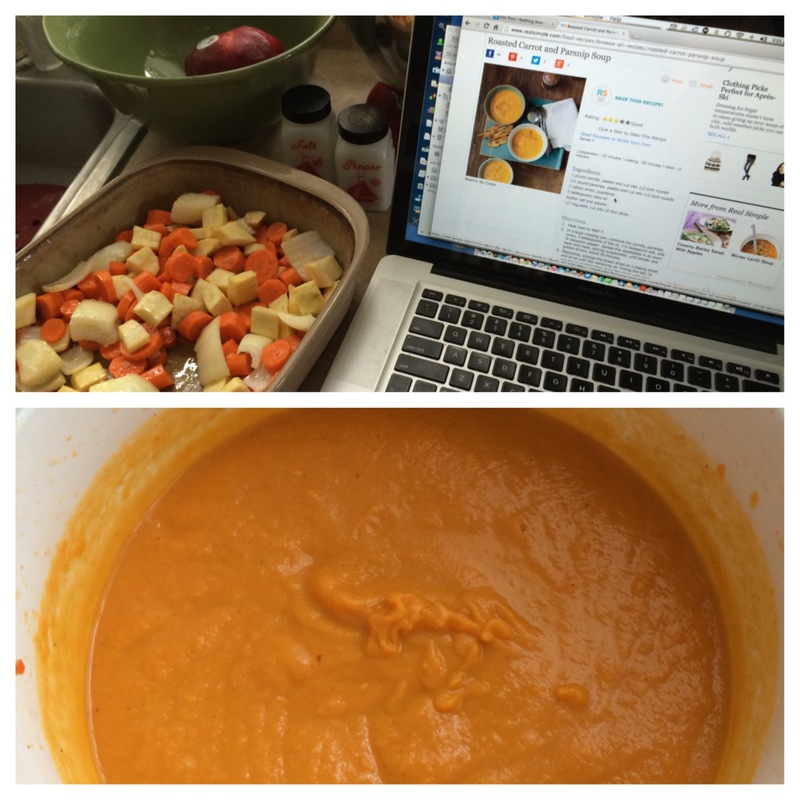 So far today I finished this soup and a set of cards to send to family…I’m a ’15 Finisher! (My 2015 Theme is Finish in ’15) Three other sets of cards to finish today….long overdue thank you notes, holiday cards (taking advantage of the one month grace period – that’s real right?) and Teamworks letters to potential new friends in Florida. Yay! Happy 2015 to you! May you have love, peace and joy in this new year…. I’ve been granted another day….I would like the whole year please, but I know there are no guarantees so I will SAVOR EVERY MOMENT (Thank you for that reminder, Joe Moon!). 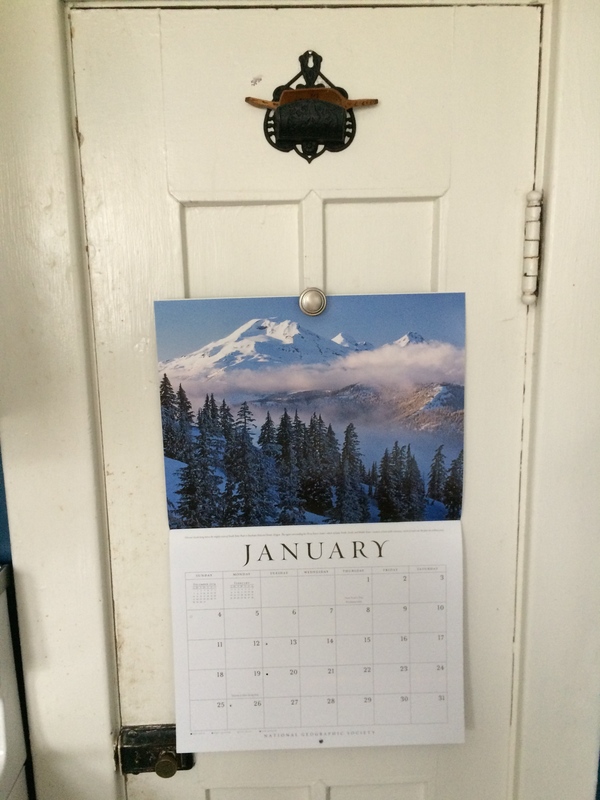 Lots happening…and the starting point is heading into another year of Nothing New! 5 years ago my first NN Year evolved into a lifestyle overhaul. This time, I have some friends along for the ride…want to join us? A week, a month, A YEAR? I shared this list on Good Day Rochester this week 🙂 How to get started on a Nothing New Challenge! If you are thinking of doing your own challenge, these questions can help you get your mind and heart around your purpose and plan…. 1. Know your WHY – What is your compelling reason for the challenge? 2. Take stock – What do you really NEED (not want) and what do you have? 3. Establish your FOCUS – Where are your spending hot spots (trouble areas)? 4. Commit to and document your TIME period – When will you start and end? 5. Determine your BOUNDARIES – What will you “allow” and how you will track your successes? 6. Have a THEME – What word or phrase represents your challenge and can keep your why on the top of your mind? WHY – Motivated by reducing my footprint, conscious consumption and financial savings. NEED – My basic needs are met every day, God willing! AND I need an electric space heater to ease my heating bills…ordered in November – will arrive in January….other than that there is NOTHING else. FOCUS – 1) Reducing plastic packaged purchases and how much plastic/trash I consume/produce 2)Streamline my clothing/closet situation – having a weird identity crises around what I wear…Like to have fewer nicer things but want them to be cruelty free, sustainable and made in USA…and not cost $2750. More on that later! 3)Household stuff (Home Depot!) – have some work to do but will not get tempted by the bright shiny objects…Less Spending. More Saving. BOUNDARIES – I will allow food 🙂 Farm eggs from Fimka and Larry only, local coffee only, make my own hummus and yogurt, local and seasonal focus 2)Will allow second-hand clothing 3)Home or car repair is OK if needed. 4)Striving for a Zero Waste Home…Paper trash bags, and compost or recycle 5)House – Allowing paint for two rooms and all interior house trim 6)Garden – will allow “new” seeds and soil if needed 6)No new toiletries until all my travel size items are gone, gone, gone. PS – Done with hair coloring and nail polish as of June 2014 – I am free! Going to track my trash production, spending and prepare for a large yard sale in June. 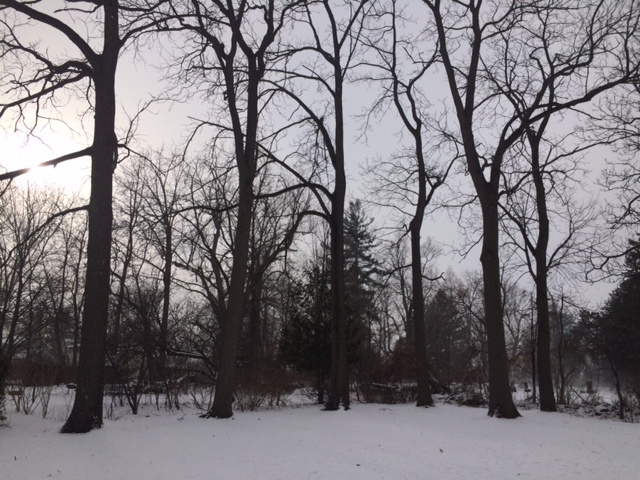 New Year….what if what you really need is nothing new?